Even best cuisines in the world would taste bland if dining table and chairs are not comfortable. Dining table and chairs should be inviting so that gastronomes do not linger over coffee. Comfort is not restricted to sitting and eating. It means that your guest should be free to make eye movement to others and his elbows do not strike with fellow eater. Some tables have a little space to spread cutlery, side bowls and guest tries to avoid passing bread basket to others. Keeping in view all these critical requirements of fine dine, designer dining table and chairs are made on perfect geometrical dimensions and brought to you by Furniture in Fashion. Dining room sets a stage for so many memories and events. It is a reflection of mood of the house and its members. If it is a formal dining environment then your dining table is the deciding coin of your formal relations. At Furniture in Fashion you will find bestseller dining room sets for homes and offices. For office use glass top dining tables are best suitable for their clean and no-frill look. Homely environment needs colours and carvings in furniture. Your dining table at home is not used for only eating purpose. If you are the lady of the house then you know how you fill it up with menagerie of sprinklers and sauces. You will showcase mats and napkins on the table. You certainly want to choose a table which speaks the language of your house only. 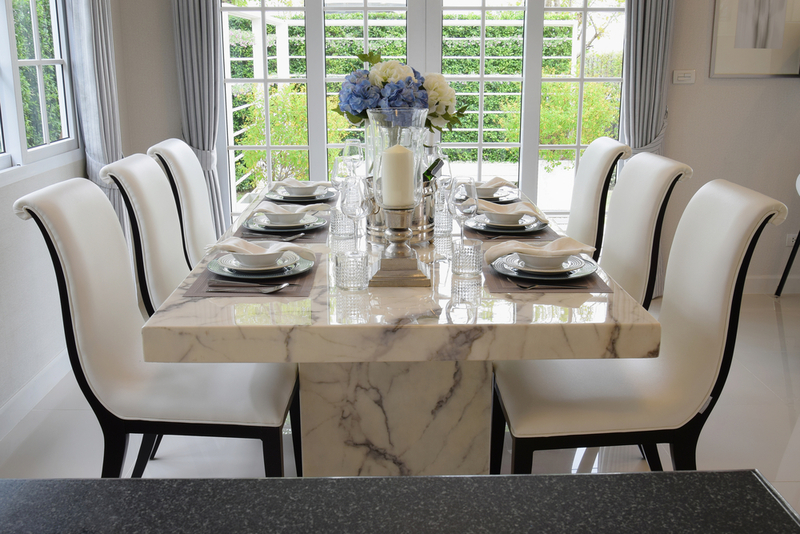 All homes are not identical, nor are their members similar, so why to choose the dining table which is found in every third house of the United Kingdom. Your home is also demanding its own dining table which has its own identity. If you are to say that lifeless things do not have their own identity then you will correct yourself after visiting Furniture in Fashion. There you will find furniture objects which speak about their beauty and their peculiarity is their only identity. Your dining room can also have such tables, chairs and sideboards that welcome guests and give them comfortable seating while they are savouring preparations. Designer tables are not like just any other dining table, they are easy to clean, spill proof and some advanced ones also have an inbuilt heating plate to keep your food warm till the last bite. A dining table plays crucial role in imagery of gourmet food. At Furniture in Fashion there are designer dining table and chairs which will enhance your everyday experience of supper. Look out the best sellers with zee chairs and simple designs. Hundreds of them are there. Dining chairs are in high gloss, metal, wood, cushioned, upholstered and much more. There are compact tables and extendable tables. There are tables in marble, granite and other stones. For formal dining events there are polished tables and tables with glass tops. The designer set of dining room furniture is innumerable and each piece speaks the style. Visit Furniture in Fashion for designer dining table and chairs.